It's the perfect combo - just grab your sunglasses and a paperback. The loungers await. Before you get too crazy booking shows and excursions, save room in your schedule for the fitness center. Stainless steel appliances and even a flat screen TV in the dining area. 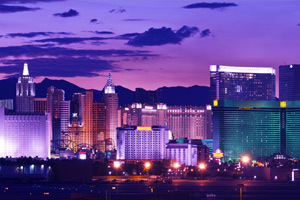 The Strip is an easy 5 minute stroll away, no need for cabs! The luxurious pool makes you want to go all out with a cabana. Stop for a quick lunch and cold drinks at the poolside bar. Don't miss the Bellagio Fountain show – you can see right off the Strip. Planet Hollywood Resort & Casino is within easy walking distance. A soak in the jetted tub is a must. Adjacent to the lively Planet Hollywood Resort & Casino, Elara is a 52-story tower in the center of the action at the heart of the Strip. The sunny tropical pool deck is likely where you’ll be spending most of your time (assuming you’re not out shopping, sightseeing or day spa-ing). Spring for a cabana if you’re feeling fancy, or just pull together loungers so there’s room for the kids who come looking for a towel or snacks or pool toys. If you’re not up for assembling sandwiches back at your suite, the poolside Oasis Bar & Grill makes a great Plan B. Somewhere between hot tub stops and casino visits, look for a window to hit the fitness center – it’ll make it easier to justify dessert at dinner or drinks at the stylish lobby bar later. One- and two-bedroom suites are brilliantly set up with separate sleeping/living spaces, so the nappers can nap while the gamers game (and jetted tub soakers soak). The wraparound leather sofa invites your whole crew to collapse after an exhausting afternoon of cannonballing and retrieving dive sticks from the pool, so you may want to start that movie earlier than planned. Just push the magic button that closes the curtains over those stunning views from the floor-to-ceiling windows, and use the home theater to project on the eight-foot screen. Can’t agree on animation vs action flick? There are two additional 42-inch TVs, plus a 24-inch screen in the dining area if you want to stay close to the fresh batches of popcorn and drinks in the kitchen. The casinos are a given (obviously), but there’s a whole lot more to Vegas than slots. Thrill-seekers will find record-breaking roller coasters right on the Strip, plus SkyJump, a controlled free fall from 108 floors, or the X-Scream, a teeter-totter hanging a dizzying 866 feet above the sidewalk. Fan of fancy cars? Drive a Ferrari around the Las Vegas Motor Speedway. Or keep it semi-low-key (if you call 170 shops and restaurants low-key) and hit the Miracle Mile – it’s adjacent to the Elara tower, so you don’t even have to step outside.